Silvia is a wonderful, smart and beautiful girl, mom of a 3 and a half years old daughter. She is interested in butterflies, books, and crafts. Last night I was fascinated by a documentary on the migration of Monarch butterflies from Mexico to North America. Those wonderful images have inspired this creation. 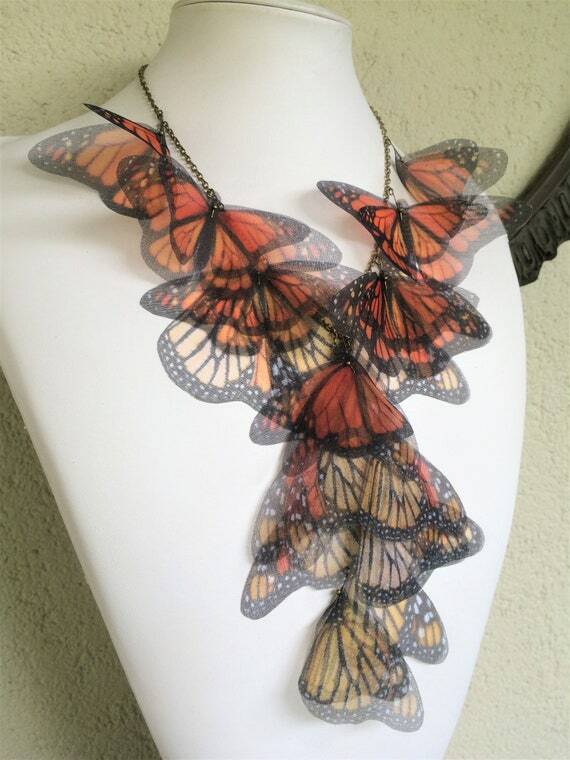 There are over 25 bright orange Monarch butterflies and wings on this necklace, and each one measure from 5 to 11 cm. Antique bronze (or silver) chain is long about 45 cm (18 inches) with frontal chain of 14 cm where butterflies are hanged, with lobster clasp. I can also customize your necklace as you prefer! Convo me before to buy! 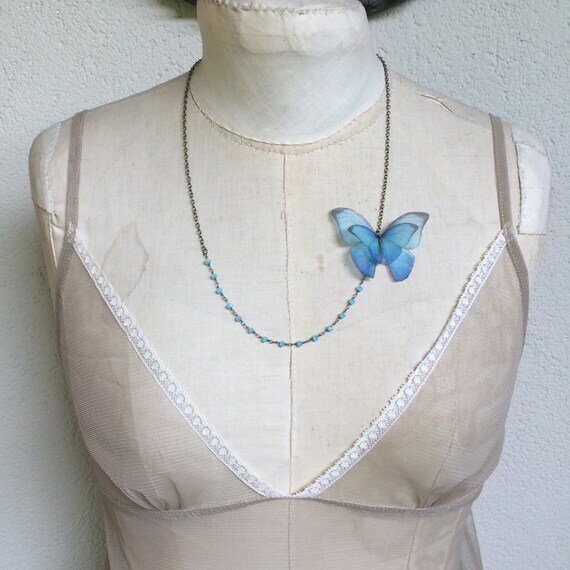 Lovely handmade necklace with beautiful silk organza Morpho Blue butterflies. Butterflies measure about 6 cm. wingspan. Antique bronze beaded chain is long about 60 cm. (23.5 inches) with lobster clasp. Lovely hand-made bobby pins with teal and blue shades butterflies. I choose butterfly images from real pictures and vintage illustrations. Then I print them on high quality cotton and silk organza, hand-cut one by one and seal edges to prevent fabric fraying. Butterflies bobby pins are delicate. You can wear them on your hair every day but don’t stretch butterflies, don’t wash (also if they are waterproof). 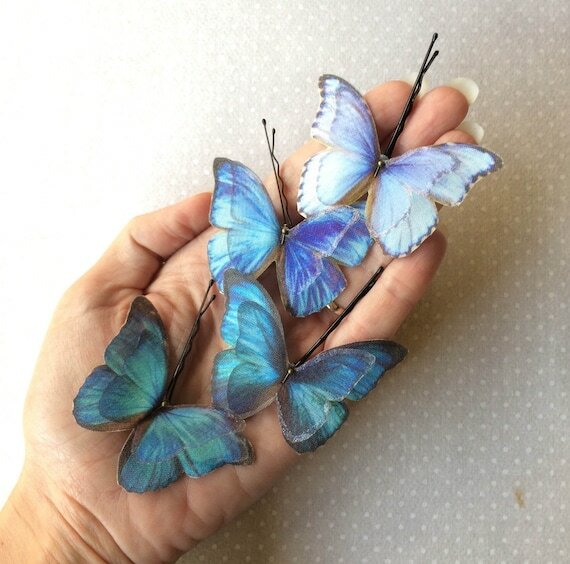 These bobby pins are made using 2 butterflies: one in cotton and one in silk organza. They measure about 6,5 cm. Black bobby pin is long 5 cm. In the last photos you can see a bride wearing some butterfly hair pins! 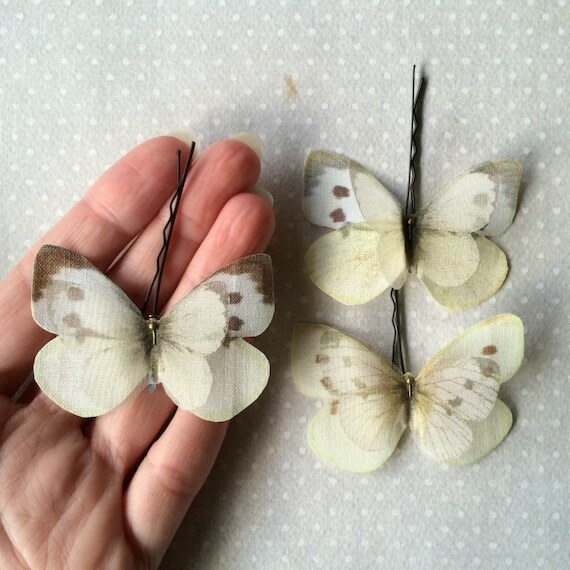 Lovely hand-made bobby pins with white and ivory Pieris Rapae butterflies. 3 pieces. I choose butterfly images from real pictures and vintage illustrations. Then I print them on high quality cotton and silk organza, hand-cut one by one and I seal edges to prevent fabric fraying. They measure about 6.5 cm. Handmade ring with two real raw polished Ethiopian Welo Opals to the ends. In my photos you see three rings. Price is for one ring! Every opal stone used is unique, nearly transparent with colorful fire. Please allow for slight differences in stone color, shape and size. This dainty ring is perfect for stacking or wearing alone, perfect in every outfit! It is adjustable, light and really comfortable to wear, also for young girls. The band is thin 1.5 mm. You can choose between copper or sterling silver 925. 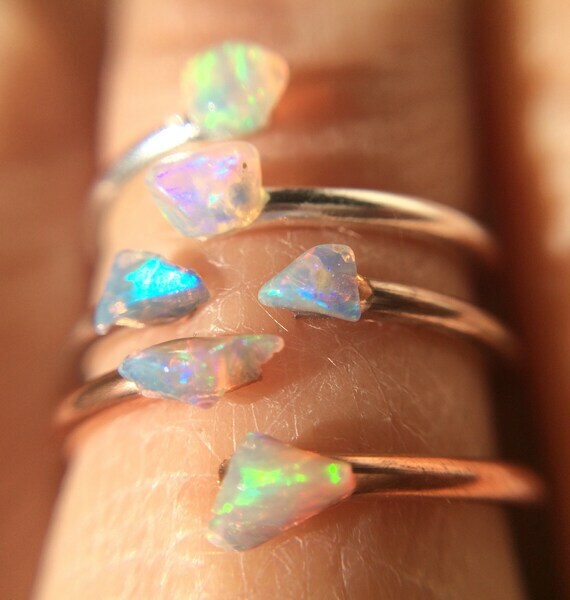 Opals measure 2 to 3 mm each one. Wearing copper has several important benefits: First, copper is an essential mineral for humans, and wearing copper jewelry has the benefit of slow copper absorption- perfect for proper assimilation. It’s also been claimed that headaches, arthritis and joint pain. Copper reacts naturally with our salty skin (which can be created whenever we sweat) or with cer­tain hand lo­tions and parfumes, and sometimes turns skin green.. it’s totally normal! To avoid this, you can apply a polymer coating to rings to act as a barrier between skin and the metal. Nail polish is one option. Be aware you’ll need to reapply the coating from time to time since it will wear away. Please remember to remove the ring before bathing, cleaning or sleeping. I’ll ship the ring gift wrapped, for you or your loved one. These opals will fly to you with registered tracked airmail by Poste Italiane shipment service.